Tony Zambotti and Manny Badillo and other activists at "9/11 Conspiracy's in Our Time" at Official Museum Preview Site. 1. Apologies about the audio. 2. Footage was not taken inside as security moved on those of us with camera's. WACNYC and other citizen activists represented the reality based community on the humid city with much gusto. I shot the footage and attended the event. Note : The man with the blue backpack and black hair whom Tony Zambotti approaches, spoke up and defended the official wtc7 explanation during the 15 minute question and answer session , and i pan to him coming out. I was hoping the speaker would confront him, but Tony Zambotti catches him. When confronted outside, he says some really bizarre things. Like "WTC7 was the stupidist, worst built building in the history of humankind." Then he goes on about the Titanic. The look of disgust on Tony's face is priceless. Satyavira on Thu, 05/26/2011 - 2:06pm. ... desperate to paint WTC7 as ' the worst built construction' ever, 'built worse than the Titanic", desperate to laugh the whole thing off. He over-egged the pudding, protested too much. What's he got in that large backpack? A heavy-tomed manual? A camera and listening device? A lunchbox with a boiled egg and an apple? A toy model of the Titanic? Simple Truths on Sat, 05/28/2011 - 2:20am. Orangutan. on Thu, 05/26/2011 - 3:49pm. "The National September 11 Memorial & Museum places utmost value on ethical conduct and integrity. To successfully carry out our mission, we must safeguard our critical assets, including our people and information, as well as continuously improve our processes and controls. We value your input. That is why we have selected EthicsPoint to provide us with an anonymous and confidential method to hear your suggestions, concerns, or reports of misconduct". Satyavira on Thu, 05/26/2011 - 4:44pm. Who do you believe in maters of physics and engineering, Jon (court jester) Stewart or more than 1,500 architects and engineers? On matters of 9/11 and simple physics, Jon Steward is willing to be their fool and their tool. Really hard to see how a relatively smart guy like Jon could publicly mock 9/11 truth and support the official conspiracy fable in the face of overwhelming evidence. It is painful to watch Jon embarrass himself on the biggest issue of our time. Free Truth on Thu, 05/26/2011 - 7:23pm. Realize that Jon Stewart is a very rich and powerful "Jewish" man. I point this out not to be anti-Semitic, but to make one realize that most all our airways, media, and entertainment is owned and/or controlled by people of Jewish persuasion. And like here, it is not the people of our respective countries that are the problem, but rather the ruling elite. We know that there is ample evidence that elements within the Jewish State colluded with elements within our government on 9/11. 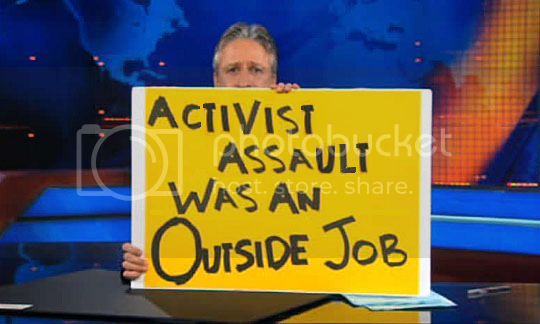 Do you really believe they'd allow a Jon Stewart to bring them down? Indeed he is smart. Smart enough to know that if he didn't tow the party line and be the flame-thrower for the "hip" younger sudeo-intelligent crowd that he could go back to doing stand-up in dives. Jon Stewart is a very clever plant. I don't know if he really believes what he does or if he's purposely suppressing the truth, but I have no doubt that he knows if he crosses that line, he's through. Either way, cross him off. He's just a very expensive version of "blue man." MrM on Thu, 05/26/2011 - 8:15pm. OMG, is Jon Stewart really Jewish?!? That explains so much! Well at least it explains why he occasionally throws some Yiddish into his jokes, and his infatuation with Baconnaise. I don't see how Stewart's ethnicity has anything to do with his stance on 9/11 though, as the vast majority of people I've seen who hold similar perspectives on the matter aren't Jewish, "very rich and powerful" and otherwise. Pavlovian Dogcatcher on Fri, 05/27/2011 - 2:29am. "Well at least it explains why he occasionally throws some Yiddish into his jokes, and his infatuation with Baconnaise." Anyways, good job Manny and Tony. At least the presence of a family member shows that criticism of the official account can't just be relegated to the fringe. Again, Bob Graham said there was a cover-up (and a conspiracy to do so) leading to the heart of the Bush administration. This museum could very well be a propaganda asset, in the sense that one of its objectives is to quell 'conspiracy theories'. I believe a link to Sunstein and other think tanks, such as "Demos" in the UK, or at least their recommendations, is plausible. I would say this museum is a relatively mild manifestation, but it should be addressed. Thanks for doing what you did Manny & Tony. SnowCrash on Fri, 05/27/2011 - 4:37am. Where you stand can often depend on where you sit. It is naive to think otherwise. A few years ago I engaged a client/employer I worked with on the subject of 9/11/01. After viewing the materials I gave him he told me that he and his wife both knew that 9/11 was a false flag. Then, in a hushed voice (in his own house), this Jewish architect/contractor told me that he couldn't join ae911truth.org because he was worried about the backlash from people he knew in the Jewish community. He also said he would not be surprised if the Mossad was involved. If an everyday guy, an architect/contractor in a small town in northern California feels the heat, what kind of pressure do you think a media star might feel? Ever hear of AIPAC and the ADL? Stewart does exactly what he's told to do, just like everyone else who makes it to that level. (and if he helps break 9/11 truth into the mainstream I'll buy you the dinner of your choice wherever you want, and I don't bet). LeftWright on Fri, 05/27/2011 - 6:17am. I respect your view about the relevance of Stewart's Jewish heritage to his efforts at suppressing the truth, but I have an honest disagreement with you about that. I think it is unfair to look at a person's religion or race to determine his likelihood to be supportive of 911 truth. In the spirit of friendly fences I want to say "to each his own", but we disagree about this. In fact I rather like Stewart's nightly commentary, and I think he is vital to our democracy. Vulich on Fri, 05/27/2011 - 10:19am. to obfuscate,veil, and suppress the truth. determination to capitalize via deception. I think it fairly rare that an individual transcends his or her heritage,culture, and intrinsic worldview. Joe on Fri, 05/27/2011 - 9:54pm. Was it Mein Kampf, perhaps? zombie bill hicks on Sat, 05/28/2011 - 5:06pm. "contribute to" instead of "determine""
No, I came up with that after a lifetime of studying humanity and ten years of promoting 911 TRUTH. Joe on Sun, 05/29/2011 - 9:56am. Anyone that has been doing any activism on 9/11 runs across people exactly like the "blue-man." There's not much to do but wave them off, because they are either delusional, and may even therefor be dangerous, or paid misinformation agent provocateurs. Don't waste any time on "blue men." But I would make the sidewalk outside that place a lighting-rod and one of my protest bases for distribution of truth too counter that monument to propaganda. MrM on Thu, 05/26/2011 - 7:55pm. have they privatized the sidewalk outside of the museum? Yes, there should be as frequent as possible a presence in the near vicinity to this insult to all those who lost someone on 9/11/01 or due to the 9/11 wars and perpetuation of the BIG LIE. Hopefully, I will make it out to NY to visit some family and a few key places in NYC by the anniversary. As Robin Hordon likes to say..."don't waste time arguing with idiots, focus on people you can influence". The truth shall set us free (well, a few people may lose some freedom due to their own choices). Love is the only way forward, and the sociopaths behind 9/11 don't understand love, so they will not be moving forward with the rest of us. LeftWright on Fri, 05/27/2011 - 5:57am. 1970 "Brotherhood of the Bell". Theres an interesting scene toward the end where the protagonist and a chat show host and his audience discuss who's "really behind the conspiracy". A red herring argument then and now. Satyavira on Fri, 05/27/2011 - 11:51am.